Reminder: FY19 DAU registration is open NOW! Go claim your seat before they’re gone! New Acquisition Pre-Command Policy Alert: As of April 2, there is a new Army Acquisition Workforce Policy outlining pre-command requirements, Mandatory Requirements for Individuals Selected for Centralized Selection List Acquisition Key Billet and Product Managers, Acquisition Directors, Contracting Commanders, and Centralized Selection Board Project and Product Directors. This policy outlines the pre-command mandatory requirements and prerequisites prior to assuming a Command or an Acquisition Key Billet. For additional information, visit: https://asc.army.mil/web/alt-workforce-policy-procedure/. Big news for Small Business: Under the guidance of Dr. James Galvin, Acting Director Department of Defense Office of Small Business Programs (DoD OSBP), Small Business will work towards becoming an official acquisition career path instead of an acquisition career field. The Army DACM Office will continue to update as DoD OSBP works to implement the Acquisition Career Path Job Specialty Code. This three-year developmental program provides expanded training through a series of educational, leader development and broadening assignments for members of the Army Acquisition Workforce. Check out the page for more information on applying next round. There’s a method to our Army Acquisition Workforce (AAW) Talent Management! The Army DACM Office recently published an overarching AAW Talent Management Strategy. If you want more information or want to know what the heck a Talent Management Strategy check out our Talent Management page. Time is running out!! Senior Enterprise Talent Management/Enterprise Talent Management (SETM/ETM) are the innovative programs we’ve all been asking for and applications are light so far. Targeted at Army Senior Civilians, (GS-12/15 or equivalent), SETM/ETM expand and enhance our civilian professional and leadership development competencies to meet the Army’s long-term performance needs in the most productive and efficient ways possible. The application window is closing fast: May 15. Army Civilians must volunteer and apply via the SETM/ETM automated system at https://www.csldo.army.mil/. SETM/ETM is a “command” executed program. If you are in a Program Executive Office, your POC for more information within the U.S. Army Acquisition Support Center Direct Reporting Unit is Ms. Joyce Junior at joyce.b.junior.civ@mail.mil or 703-664-5684. The FY20 Centralized Selection List (CSL) Project Manager Announcement application window closes on June 6, 2018. Please visit our CSL website: https://asc.army.mil/web/centralized-selection-list/. Keep your eyes open, the Product Manager announcement will open in June. The FY19/FY20 Project Director (PD) centralized selection board application window is OPEN April 30-June 20. The civilian-only centrally selected PD board is one of the Army Acquisition Workforce’s senior leadership major talent management initiatives for our Program Management community, providing an opportunity to select high-performing civilians with leadership potential. PD is also the Army DACM’s benchmark effort to provide additional development and growth opportunities for high-performing, high potential civilians, while building a larger talent pool for future senior leader requirements. Eligibility requirements (currently possess): (1) Level III certification in Program Management (PM) acquisition career field; (2) Army Acquisition Corps member; and (3) GS-15/ broadband equivalent. Additional information: https://asc.army.mil/web/career-development/prod-dir/. 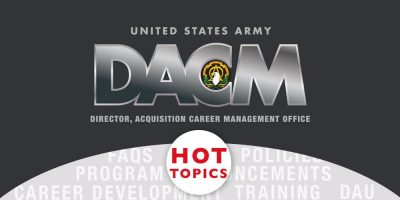 The FY18/Fourth Quarter CMF 51, the Career Management Field for contracting, is accepting career field reclassification packets for consideration for all active duty and reserve component Sergeants (to include Sergeants promotable) and Staff Sergeants (not applicable to Army National Guard NCOs). The accession panel is scheduled for the July 23-27 and the application window, currently open, will close June 11. The application should be completed in Career Acquisition Management Portal (CAMP) at https://rda.altess.army.mil/camp. For additional information please go to the following link: http://asc.army.mil/web/ and click on the MOS 51C tab, then Active Component Reclassification Program.